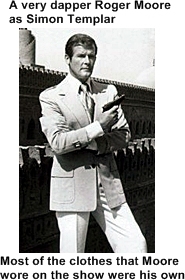 Roger Moore would usually address the viewers during the credits and give some sort of brief description about that episode. Join The Saint as he deals in danger, dices with death and always surrounded by a galaxy of gorgeous girls. 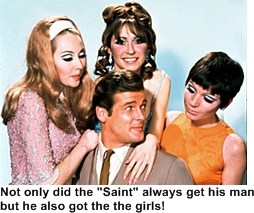 Whether its girls or guns, The Saint can handle the situation. 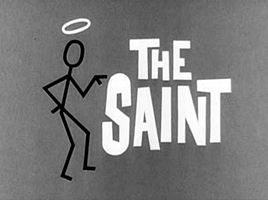 Simon Templar (Roger Moore) nicknamed The Saint is a high class, suave, well polished thief. But not so fast, he is not your ordinary thief, he steals from criminals in such a way that they get caught with their hands dirty by the law. 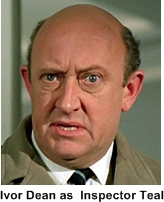 The law in this case is Inspector Claud Eustace Teal (Ivor Dean) who willingly locks up Templar’s victims but also relentlessly tries to lock him up. During this process he manages to keep whatever he stole from the criminal for himself which has made him enormously wealthy. If the criminals put up a fight he is quite efficient with a gun or at hand to hand combat. Templar prefers to solve things less violently by using his considerable charm, wit and good looks. These attributes also land him beautiful women by the scores, which he seems to love and leave because there were very few recurring women characters. The women, the clothes, the car, the travel to exotic locales all created a sophisticated modern day Robin Hood. 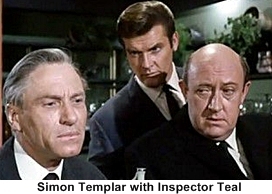 The series originated in the U.K. based on a considerable number of books written by Leslie Charteris. The first couple of seasons were almost exact screen plays of the books but later on the writers took some more license and expanded the Templar character into a sort of quasi secret agent. It hit the U.S. as a syndicated show but did so well in syndication that it was picked up by NBC and run in prime time. 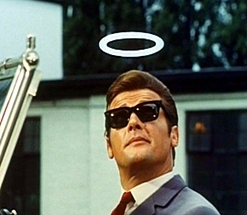 Roger Moore was asked to play the part of the first James Bond in Dr. No but turned it down because of his commitments to The Saint. Coincidently Moore was not the first choice for The Saint, Patrick McGoohan who had just finished the Danger Man series was contacted first. The producers of The Saint originally wanted Templar to drive a Jaguar but when they were turned down by Jag for a promotional car they contacted Volvo. Volvo supplied at least a half a dozen cars to them over the shows six year run and felt that it was the best advertising that they had ever received. Volvo was also chosen to be the car in the 1997 Saint motion picture with Val Kilmer.